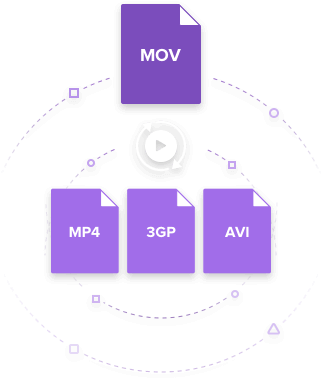 Convert MOV to WMV, MP4, AVI, FLV and other 1,000+ formats. We know, QuickTime files are all MOV format files, and developed by Mac. However, WMV is developed by Microsoft, and mainly used in Windows. Since the two giant companies compete forever with each other, the two type of format files are completely incompatible with the programs based on each other's platform. For example, QuickTime MOV files can't be played in Windows Media Player. You have to convert QuickTime to WMV for wide uses on Windows platform. This article here provides you with a best way to help you convert QuickTime MOV to WMV. 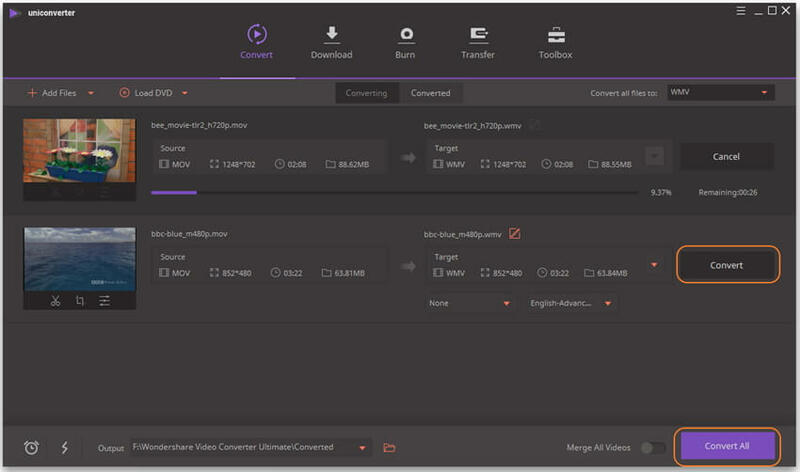 That's to use an easy-to-use yet professional QuickTime to WMV converter. The smart tool can not only let you do this job quickly, but allow you to convert files without any quality loss. After video conversion, you're able to watch, edit, or play QuickTime movies on Windows-based programs freely. Just follow the guide below to convert QuickTime to MOV step by step. First of all, find out which folder that includes your QuickTime files, and then choose the files you want to convert. After launching this great Wondershare software, you can directly drag and drop the selected files from the folder to this program's window. Or you can click the + Add Files as an alternative. The imported MOV video will be displayed in video thumbnail as the screenshot shows. It's very easy to find the WMV format in its output format list. Click the icon to expand the output format list, click Video tab and choose WMV from the left side bar, and then select the video resolution in the right to confirm the output format. Go to the lower-right corner of the interface where you need to click the Convert button to start QuickTime MOV to WMV conversion. This program will finish all of the tasks with ultrafast speed and in high quality. If you minimize the current window, this program will run in the background, without interrupting your other computing tasks. After conversion, you just need to switch to the Converted tab to locate the output WMV files. Now, enjoy yourself.